Get back on track with Tag-Along Bike Trailers, available exclusively at Mytopia. Taking your kids with you wherever you go has never been easier. Now you can go for a quick jog or bike ride, without having to mentally manage how you can juggle that with minding the kids. 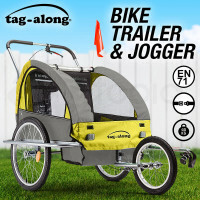 Tag-Along Bike Trailers allow you to take your child with you while doing the things you love. Simply attach the Tag-Along Bike Trailer to your bike with the universal coupler, stash the toys and snacks into the spacious storage pockets, secure the kids with the 3-point harnesses, and off you go. Protect your children from the elements with the all-weather canopy and sun-screening mosquito mesh. Enjoy a smooth ride over any terrain with the pneumatic tyres. 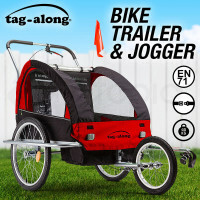 You can even convert the Tag-Along Bike Trailer into a stroller. With its lightweight construction and full-length handlebar, jogging with your children has never been this easy. Feel independent again - take your kids with you on a Tag-Along Bike Trailer, only from Mytopia. For all other fitness needs, check out Mytopia’s extensive range of affordable and durable Bicycle Trainers, Electric Bikes, Exercise Bikes, Car Bike Racks, Treadmills, Spin Bikes, Rowing Machines and Cross Trainers. Reliability assured, all Tag-Along Bike Trailers are backed by an Australian standard 12-month warranty for private household use. 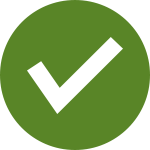 Mytopia guarantees fast and easy delivery to all corners of Australia, whether you’re in Sydney, Melbourne, Perth, or the Outback. 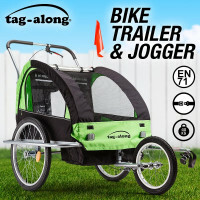 Hit the trail with your kids, buy a Tag-Along Bike Trailer today.